One of the newer, more innovative approaches to the art of growing tomatoes have been growing tomatoes upside down. Tomato plants grown this way have been observed to bear increased yields when compared to plants grown the "normal" way (right side up) in containers. This increased productivity is due to increased air circulation to the leaves when the plant is hanging in midair, more disease resistance from avoiding contact with garden soil, and improved nutrient absorption from watering and fertilizing from the bottom of the plant. But the best thing about growing tomatoes this way is that staking is not needed! Growing downwards, the entire weight of the plant will be evenly distributed through all its branches. You can grow any variety of tomatoes upside down. However, smaller fruited varieties are preferred, for obvious reasons. But with any variety, if the plant gets too big and starts to touch the ground, simply cut off the growing tip to stop vertical growth, and the plant will develop laterally. A few varieties that are more suitable for being grown upside down are Early Girl, Sun Gold, Bush Celebrity, and Pink Ping Pong. Some pruning may be needed to keep plants under control. Thankfully, pruning is an easy task when the plant is grown upside down, as the branches are more accessible. Very large plants that bear a lot of fruits all at once are not desirable for growing tomatoes upside down. The last thing you want is to have the container collapse from the weight of all the fruit, which is really, really bad for the plant. Unless you have a very solid container, it's preferrable to prune the plants to a manageable size. Yes you won't see maximum fruit production via pruning, but you will be maximizing the efficiency of the tomato plant. A well-pruned plant will bear less fuits at one time, but the fruits will ripen faster and be of higher quality than a plant that's not pruned. The ideal planter for growing tomatoes upside down is a 5 gallon bucket with a metal handle. 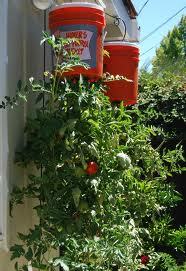 Studies have shown that 5 gallons is the ideal container size to maximize the space/production ratio of tomato plants. 2. Prepare your tomato transplant by removing all but its top set of (big) leaves. 3. Hang the bucket right-side-up with its handle somewhere low so you can reach to the bottom. Remove your transplant from its container and carefully stick the plant through drilled hole so that the plant is sticking out from the bottom of the bucket. Hold the plant in place so that there is about an inch of stem sticking out of the bottom. 4. With one hand holding the plant, start packing peat moss inside the bucket around the stem all the way up to its roots. Evenly distribute the moss around the bucket, and carefully let go of the plant, making sure that it’s securely anchored inside the bucket. 5. Fill the bucket with the tomato growing mixture until about an inch from the top. 6. Hang the bucket at its final destination where it will reside and water thoroughly. Note that most varieties will grow to at least 5 feet, so keep that in mind when choosing where to place the plant. Once the plant has grown to a respectable size, it's not advisable to move the planter around, as that will disrupt root formation and possibly break a few branches. 7. About 5 days after transplanting, fertilize from the top with a water-soluble fertilizer. And there you have it, a good-to-go tomato plant grown upside down. Like all container vegetables, make sure to water and fertilize it regularly. Mulching the opening of the planter is also recommended to prevent evaporation and water loss. Red pine mulch is the most popular, but you can also cut up a black garbage bag and use that cover the opening of the bucket. Tie the bag around the bucket with a piece of string, and cut an opening on the bag where water and fertilizers can enter. An automated container drip watering system can also be set up with your upside down planters. This reduces the hassles of watering.